Carbon Nanotubes Market size was over 2.0 billion in 2017, with projected gains over 22% CAGR between 2018 and 2024. Unique atomic arrangements of carbon nanotubes (CNT) offer attractive features, stimulating penetration in various end-user market. Several potential applications of carbon nanotubes are based on its properties. In the area of nanoelectronics, CNT demonstrate wide array of applications such as energy conversion devices, energy storage devices, photovoltaic devices, etc. Moreover, the product finds widespread applications in chemical industry such as in air pollution filters, water filter and chemical nanowires. CNT market will be steadily driven by the needs and trends of electronic and electrical industry. By the end of 2024, total production of electronic goods will accelerate owing to rising demand for advanced defense related electronic products, mobile phones, computer and TVs. 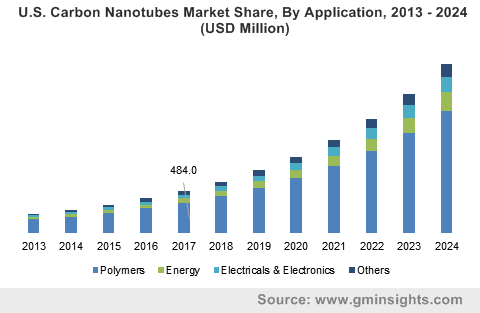 Growth in electronic and electrical sector is likely to augment due to rise in demand from household led by changing consumer lifestyles and easy access to credit, triggered by growing consumer disposable income thus positively influencing the global carbon nanotubes market. Further, several government policies especially in Asia Pacific region, including duty relaxation, taxes exemption schemes along with FDI allowance in the sector will propel higher returns from the industry. For instance, Malaysia sales revenue of electrical and electronic industry had increased from USD 53.34 billion in 2015 to USD 57.87 billion in 2016. Such escalation exhibits substantial potential for carbon nanotubes in electrical & electronics sector in near future. CNT have diameter range from 0.7-50 nanometers, often found in single sheet of pure graphite, forming cylindrical structure which enables its energy sector applicability for instance, in batteries, solar cells and fuel cells. Carbon nanotubes usage for enhances the efficiency and reduces the cost of solar cells, fuel cells and batteries. It improves cycle life of batteries, enhances it performance at cold temperatures and offers 25% improved charge-acceptance. According to OECD energy report, during 20th century the global population grew 4 times, economic output 22 times and fossil fuel consumption up to 14 times. Thus, a world economy 4 times larger than today will use around 80% more energy in 2050. Such trends exhibit that over the forecast period global energy demand will grow phenomenally, positively influencing the global carbon nanotubes market. The market growth shall be hindered by high operation cost of carbon nanotubes to some extent in coming years. The products are chiefly produced from chemical vapor deposition (CVD) methods. Primary raw material used include: methane, ethylene, and acetylene along with metal catalysts in the reactor. CNTs are derived after several purification procedures which result in increased process complexity. Consequently, this will lead to higher product cost negatively impacting global carbon nanotubes market over the projected timeframe. Further, prolonged exposure to nanoparticles may cause chronic disorders to employees at workplace which may further restrain market growth. Multi-walled carbon nanotubes led the overall carbon nanotubes market in 2017. The segment has CAGR of 22.0% and is estimated to follow similar growth trend over the forecast timespan. Multi-walled carbon nanotubes will have robust demand for their usage in tear resistant fabrics & waterproof cloth, electrical circuits, food packaging and vessel for delivering drugs, etc. Single-walled carbon nanotubes segment is likely to grow with a CAGR close to 20% by 2024. The increasing product demand will be attributed to rise in energy sector such as application in batteries, fuel cells and solar cells, etc. This in turn will augment the market size at a remarkable pace. Polymer segment constituted highest share exceeding 60% of carbon nanotubes market in the year 2017. Applications of carbon nanotube nanocomposite in sensors, actuators and sporting goods have been growing in recent years. Further, unique properties of epoxy and carbon nanotube composites enhance the characteristic features of carbon nanotube. Consequently, epoxy carbon nanotube composites have significant application in automobiles, aerospace, fuel cells, wind turbine blades, electromagnetic interface shielding and radar-absorbing material. Electrical & electronics segment particularly led by technological advance gadgets and home appliances products is projected to witness substantial growth in the coming years. Positive shift in consumer lifestyle and increasing working population had increase the consumption of electrical and electronic products, will stimulate higher demand for carbon nanotubes by 2024. Asia Pacific led the global carbon nanotubes market in 2017 with a CAGR of over 23%. The United Nation reported that by the end of 2018, Asia-Pacific region will have more people living in urban areas than rural areas. The region will be a home to more than 2.1 billion urban residents or 60% of the world’s urban population. Demographic shift along with urbanization and sustainable development trend is likely to escalate economic and social factors favoring the carbon nanotubes market over forecast period. Carbon nanotubes product is likely to witness steady growth in North America market with a CAGR of 21.7%. According to the U.S. Bureau of Labor Statistic report published in 2015, the U.S. income growth is expected to stay stable by the end of 2024. Due to investment growth in the region, the U.S. housing market will be flourished with increasing businesses and households demand. Moreover, government expenditures are estimated to contribute slightly less toward net GDP growth, shifting focus toward social welfare payments. Such instances exhibit that over the forecast period carbon nanotubes market will generate favorable gains over the forecast timeframe. Key manufacturers in carbon nanotubes market include: Arkema SA, Nanocyl SA, Continental Carbon Nanotechnologies, Nanothinx S.A., Hyperion Catalysis International Inc., Klean Commodities, Future Carbon GmbH, etc. 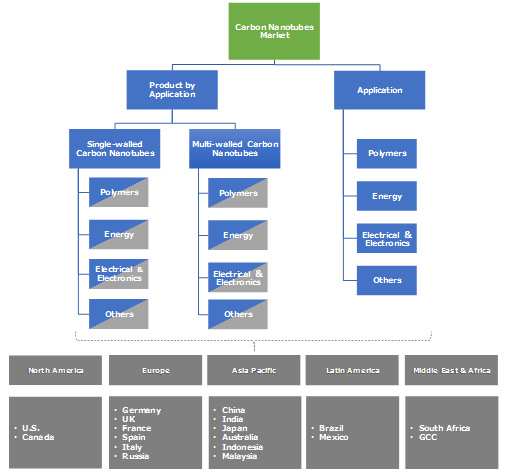 Prominent carbon nanotubes industry leaders have global footprints with different manufacturing hubs and supply chains network around the globe. Producers are involved in mergers & acquisitions agreements to enhance their product portfolio and strengthen market position. For instance, in March 2014, Future Carbon GmbH was into the production of carbon super-composites and acquired the intellectual property relating to carbon nanotubes from Bayer Material Science. Bayer, which is one of the major players in the polymer composites market globally and offers high-tech polymer composites. Carbon nanotubes are thin cylinders of carbon, it is large macromolecules which have unique physical properties, size and shape. CNT have wide range of thermal, structural and electronic properties, its light weight features helps in extending product lifetime and efficiency. Application of carbon nanotubes in several products had reduced mechanical stress as well as enhanced strength. Consequently, its application in several light weight products have gained high market value and successfully responded to global needs & trends.